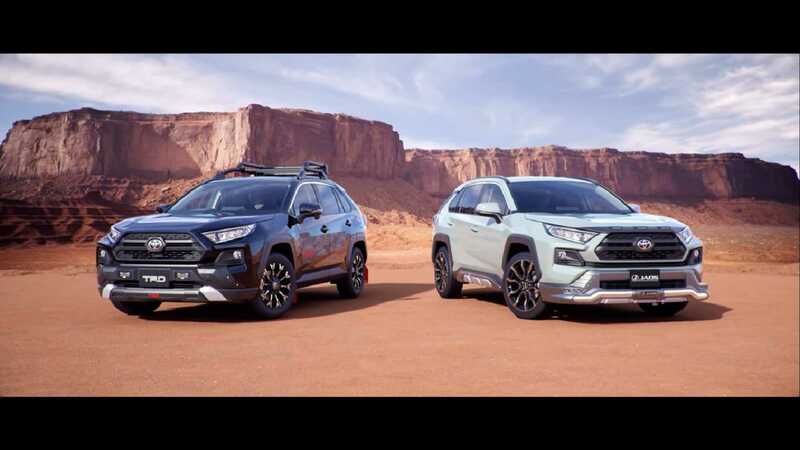 Toyota has made four new versions of its RAV4 SUV available in Japan, two of which have been designed by Toyota Racing Development (TRD) and the other two by Modellista. The TRD trims are called the Field Monster and the Street Monster. The former sports 17-inch Crimson MG Monster wheels, red splashguards, wheel arch extensions, an off-road front bumper with additional LED lights attached, a roof rack, and a different interior trim. In turn, the Street Monster package includes bumper moldings, a few styling parts, and a set of 20-inch TRD TF X-Limited wheels. The Modellista AeroKit contains 19-inch wheels, side skirts and a front spoiler. The other kit, called JAOS, is generally suited for off-road use and incorporates protective shields for the undercarriage along with 20-inch wheels. The Toyota RAV4 ships in six different versions on its home market in Japan, and comes with a choice between front drive and AWD. By default, every car comes equipped with an in-house-designed safety package and a DCM comm module that maintains a constant Internet link.